Rhino dehorning is not a pleasant thing to witness. Just the mention of it evokes a sense of brutality. It is a sad reality that in order to help save rhino species from the threat of poaching, the pre-emptive removal of their horns in a safe, controlled manner has become one of the necessary and highly effective management tools for conservationists to deter poachers. One would hope that it would be generally understood that rhino horn is essentially an overgrown fingernail – made mostly of a tightly-packed protein called keratin. 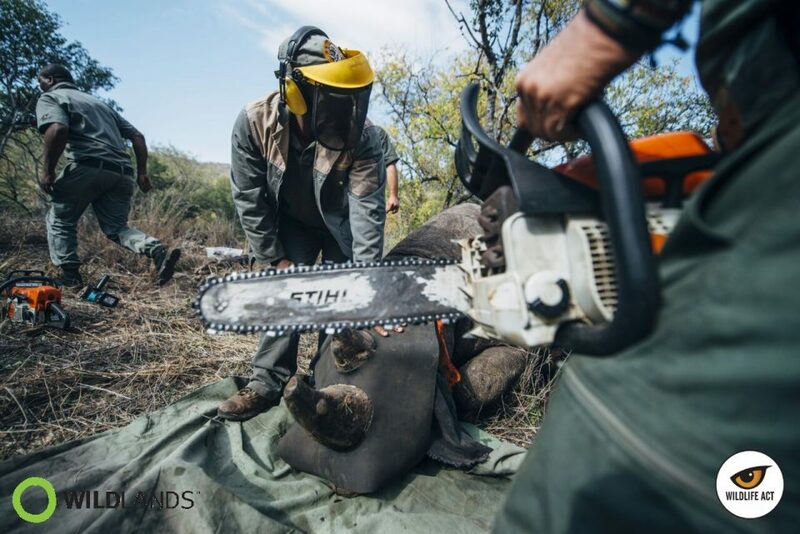 Even though rhino dehorning requires a chainsaw and even an angle grinder, the process is carried out by an experienced veterinarian and is a painless experience for the animal under sedation. How is Rhino Dehorning Done? Every precaution is taken to ensure that rhino dehorning is as stress-free for the animal as possible. This begins with sedation by a dart administered from a helicopter, containing a powerful opioid drug. Once the animal is under sedation, the sedative is partially reversed. This is so that the animal can continue to breathe unassisted. Its eyes are covered with a large blindfold, its ears are plugged to drown out sound, and if necessary, its body is kept cool by the ground crew continuously spraying water on it. Wildlife ACT volunteers and donors are regularly involved in rhino dehorning operations in protected areas in Zululand, with Wildlife ACT, as active members of Project Rhino, regularly assisting with either funding for the operations or providing expertise on the ground. The day before a rhino dehorning, rhino monitors generally track the target rhino to establish its location, which is subsequently confirmed again early on the morning of the operation. The wildlife vet, always a “veteran” of successful rhino dehornings, delivers an important safety briefing to all those who are to be involved in the rhino dehorning operation. 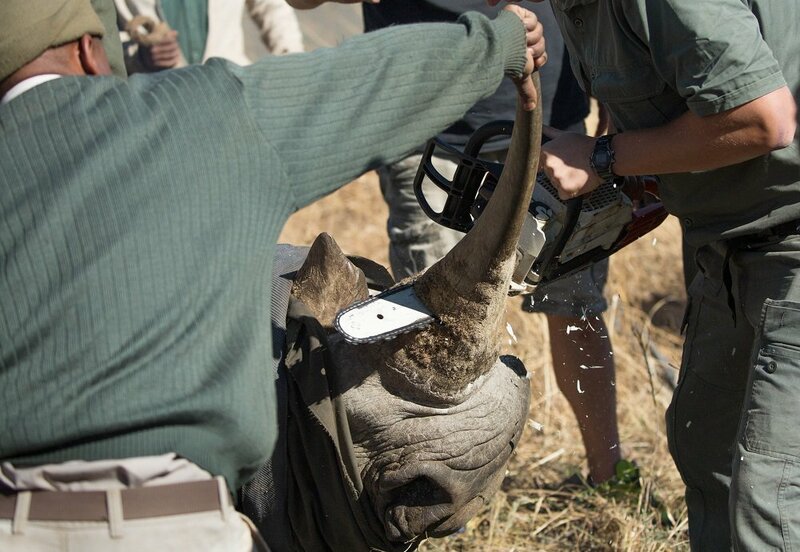 In these operations the vet always calls the shots for the safety of both the rhino and the people working with it. All involved are warned not to get anywhere near the dart’s entry point, as contact with the drug can have serious effects on a human. The vet does carry an emergency antidote at all times in case of accidental human contact. Arguably the most important tool for any rhino dart is the helicopter, piloted by an experienced “game-rated” pilot. 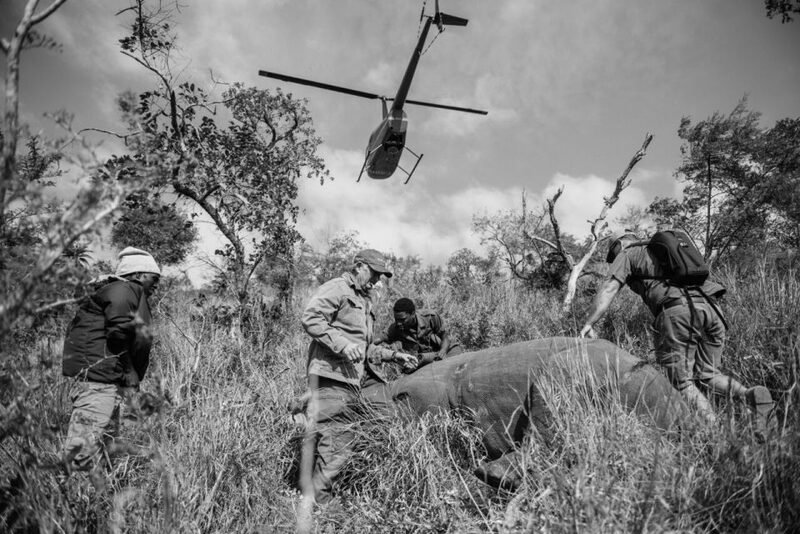 The helicopter carrying the vet, in contact with the monitors on the ground, makes its way towards the rhino’s location and almost always performs some impressive aerial manoeuvres to herd the target animal into an area clear enough for the vet to successfully dart from the air. The relationship between the pilot and the vet is a close one, with each able to read the other’s murmurs and gestures. The vet mixes his drugs and loads his dart in the air only once he has seen the target animal and assessed its size and condition. At the vet’s command and when the area is clear enough, the helicopter drops to a low enough height for the vet to fire his dart. Generally the rhino takes between three and five minutes to show sign of the drugs taking effect. The first sign is a slowing of movement and then the animal begins a slow “high-step” before coming to a halt. The pilot is highly dexterous in directing the movements of the darted rhino such that it moves safely toward an area that the ground team can access, without endangering their safety or that of the darted rhino. As soon as the rhino is immobilised, the helicopter crew notifies the ground team, who move with great speed carrying water tanks and all the necessary equipment for a fast and safe rhino dehorning. The immobilisation drugs have no lasting effects on the animals. Once the operation is completed, the veterinarian administers the antidote to wake the animal and the ground crew moves off to a safe distance. The veterinarian positions himself strategically to observe the animal coming around and ensures that the individual makes a full recovery before leaving it. It is important to note that the rhino dehorning strategy requires that every individual in a population is dehorned so that all individuals have equal advantage in defending themselves from competitors. Is Rhino Dehorning the Solution? Rhino dehorning can never be the only solution. It is only one tool in the arsenal of tools we have to try and combat rhino poaching. It is a last resort and is only implemented in certain conditions: where adequate security measures and an effective monitoring protocol are already in place, dehorning is the next available tool. Rhino dehorning is a short-term solution, and the sad reality is that it only deflects the risk onto populations that have not been dehorned yet. It is recognised that authorities still need to work hard towards a long-term solution that removes the risk entirely, and this is where higher level support of governments and others is needed to find more strategic solutions to this global crisis of unsustainable natural resource use. Broader engagements are needed to stamp out illegal trade, to enforce greater penalties within the judicial systems, and to reduce demand by end-users. Dehorning simply buys some time to work toward these objectives. Hong Kong Ivory Ban: Will Other Countries Follow Suit? New Population of Black Rhino Established!